Florida guard Kasey Hill played 27 minutes -- his most since Nov. 16 -- and scored seven points in Sunday's 76-34 win over Savannah State. Having come out of a difficult stretch on a bit of a roll, Florida is hoping to keep getting its roster together before heading into SEC play. In their final non-conference tune-up, the 12th-ranked Gators will try to get closer to a school record with their 23rd straight home win Saturday against Richmond. Florida (10-2) came away with four wins in a five-game span against Florida State, then-No. 12 Connecticut, then-No. 13 Kansas, then-No. 15 Memphis and Fresno State. It marked the first time in coach Billy Donovan’s 18 seasons that the Gators played consecutive non-conference teams ranked in the top 15. Their only loss during that stretch came when Shabazz Napier hit a buzzer-beating jumper in UConn’s 65-64 win Dec. 2. 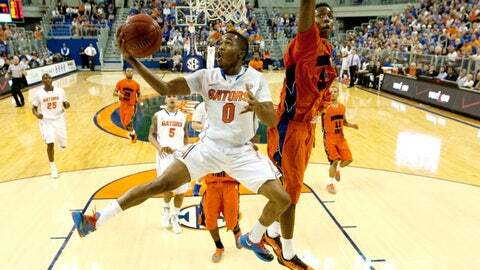 Both of Florida’s defeats have come on the road to ranked foes, including 59-53 to then-No. 20 Wisconsin on Nov. 12. The Gators look to continue their dominance in Gainesville before opening the SEC slate at home against South Carolina on Wednesday. They’ve won by an average of 22.9 points during the 22-game win streak on their own floor, two shy of the school record set in 2007. "I’m not concerned at all heading into the league or going on the road to play in any environment based on what we’ve experienced," Donovan said. "The biggest thing right now is: Can we play well and can we continue to get better and improve?" The team’s overall health appears to be improving, with Kasey Hill and DeVon Walker continuing to work their way back from ankle injuries. Hill played 27 minutes — his most since Nov. 16 — while Walker played 23 in his most action since Nov. 21 in Sunday’s 76-34 win over Savannah State. Freshman Chris Walker has been practicing, and Donovan is hoping the NCAA will hand down a decision regarding his eligibility after the McDonald’s All-American had some academic issues that kept him off campus during the first semester. "That would be great if (he could return)," said Donovan, whose squad has won four straight. "I certainly hope so, but I have not heard anything from our school about that." Patric Young led the way Sunday with 15 points while becoming the 50th player in school history to reach 1,000 in his career. Casey Prather, averaging a team-high 17.8 points, matched a season low with 10 but only played 21 minutes. Since allowing a season-high point total and field-goal percentage (47.4) in a 77-75 win over Memphis on Dec. 17, Florida has held its last two opponents to a combined 83 points and 28.3 percent shooting. The Spiders (10-4) shot a season-high 55.1 percent in their latest game, hitting 9 of 16 from 3-point range in a 70-66 victory at Northeastern on New Year’s Eve. Cedrick Lindsay had 18 points on 7-of-12 shooting and averages a team-leading 18.6. Kendall Anthony also has played well, scoring 16.7 per game with 21 3-pointers in his last six. The Spiders have won two of three all-time meetings, including a 56-53 victory over the 13th-ranked Gators in the Orange Bowl Classic on Dec. 19, 2009. Richmond put up a good fight against its only ranked opponent this season, getting within four points with less than four minutes to play in an 82-72 loss to then-No. 24 North Carolina on Nov. 23.